A period of eighty years of control from Belgrade followed during which Nikola I died in exile in France in 1921 followed shortly afterwards by the surprise abdication of his son and heir, Danilo III, the same year. The latter's nephew, Michael Petrović-Njegoš, inherited the titles of his predecessors whilst in exile in France and survived arrest and internment by order of Adolf Hitler for refusing to head up a puppet Montenegrin state aligned to the Axis Powers. Later, he served the SFR Yugoslavia as Head of Protocol. He was succeeded by his son Nicholas Petrović-Njegoš in 1986. Nicholas returned to Montenegro to support the Montenegrin independence movement that went on to achieve full sovereignty in the 2006 referendum. In 2011, Montenegro recognized an official role for the Royal House of Petrović-Njegoš in Montenegro: to promote Montenegrin identity, culture and traditions through cultural, humanitarian and other non-political activities, which has been interpreted as a "creeping restoration" of the monarchy. The present head of the house is Nicholas II of Montenegro. "Bogut" or "Boguta" is believed to be the oldest known ancestor of the Petrovic-Njegoš. Bogut was alive at the time of the Battle of Velbazhd (1330) and the building of Visoki Dečani, and perhaps into the 1340s. According to tradition, and recorded by some historians, the ancestors of the Petrović family settled in Muževice at the end of the 14th century, from the Bosnia region, from the area of Zenica or Travnik. It is possible that Bogut at that time had moved to Drobnjaci with his son, Đurađ. Đurađ or some of his sons were in the entourage of Marko Drago, an affluent Serbian nobleman who had served Serbian lord Vuk Branković (1345-1397), and as such they are believed to have also served the Branković family. Đurađ and his five sons "from Drobnjaci" are mentioned in a document dating March 1, 1399, in which they gave several items to the depository of Dapko Vasilijev, an affluent Kotoran nobleman. On the 12 July 2011 the Parliament of Montenegro adopted the Law on the Status of the Descendants of the Petrović Njegoš Dynasty. The law "regulates the important issues regarding the status of the descendants of the Petrović-Njegoš dynasty, for the historical and moral rehabilitation of the Petrović-Njegoš dynasty for whom their dethroning was contrary to the Constitution of the Kingdom of Montenegro, a violent act of annexation in the year 1918." (Article 1). The law recognises the descendants of King Nikola I in the male line and their wives as the descendants of the Petrović-Njegoš dynasty (Article 2), and appoints the eldest male heir, namely Prince Nikola II, as the representative of the dynasty (Article 5). It also affirms the House law of the dynasty by defining the succession to the headship of the dynasty as being passed down through the "male heir of the oldest male heir" (Article 5). 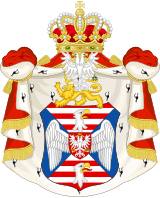 The law protects the use of the heraldic symbols of the dynasty by the representative of the dynasty, Prince Nikola II (Article 6). Article 8 allows for members of the dynasty to obtain Montenegrin citizenship and also to be dual-nationals of other nations without losing their Montenegrin citizenship. This is of particular relevance today as all of the members of the dynasty also hold French citizenship. The law also creates the non-political (Article 10) Petrović-Njegoš Foundation (Article 9), an organisation chaired by Prince Nikola II (Article 10), with its aim to "affirm the Montenegrin culture and participation in humanitarian and development activities in the interest of Montenegro and its traditions" (Article 9). From Montenegro's exchequer, the law allocates 4.3 million euros over a seven-year period to the Petrović-Njegoš Foundation (Article 11). In addition, Prince Nikola II is entitled to a monthly income equivalent to the gross monthly earnings of the President of Montenegro (Article 16). The Petrovic-Njegoš Foundation has its seat in Montenegro. "The Descendants of the dynasty are given the continuous use of the house of King Nikola I of Montenegro in Njeguši...its gardens...and meadow-land." "Descendants of the dynasty will have built for them a family home in Cetinje...and be given an apartment in Podgorica" (Article 12). To carry out their official functions Prince Nikola II has the right to use State objects and resources and "the exclusive right of use of the first storey" of the Petrović Palace (Dvorac Petrovića) in Podgorica, "and when protocol requires, use of the ground floor with priority over other users" (Article 13). The law allows for Prince Nikola II to act as a representative of the Government of Montenegro and perform other protocolar and non-political functions (Article 7). The first such undertaking was made by the Prince in July 2011 when he represented the Prime Minister of Montenegro, Igor Lukšić, at the requiem of Otto von Habsburg, former Crown Prince of Austria-Hungary. When performing functions on behalf of the Government, Prince Nikola II and the other members of the dynasty are afforded full State protocol (Article 15). Prince-Bishop Danilo II Petrović-Njegoš (1851–1852) - became Prince in 1852 as Danilo I.
Nikola I, Prince of Montenegro (1860–1910) - became King in 1910. Ex King Michael of Montenegro (1929–1986),abdicated renouncing his dynastic claim to King Alexander I of Yugosavia. Odakle su preci Petrovića doselili u Muževice i u koje vrijeme nije dovoljno rasvijetljeno. Prema tradiciji, a i zapisima nekih istoričara, doselili su iz Bosne, iz okoline Zenice, ili Travnika i da su u Drobnjake doselili, kako navodi Kovijanić, krajem 14. vijeka. Etnografski muzej Cetinje (1963). Glasnik: Bulletin. pp. 69–75. Srpsko istorijsko-kulturno društvo "Njegoš" u Americi (1983). Glasnik Srpskog istorijsko-kulturnog društva "Njegoš". Reljić, Ljubomir (1976). Jovan Erdeljanović: život i delo : Temelji naučne tradicije naše etnologije. p. 30. Vojislav Miljanić (1989). "Detalji iz života predaka Petrovića-Njegoša za vrijeme boravka ispod planine Njegoš". Istorijski zapisi br 3-4, 1989. Wikimedia Commons has media related to House of Petrović-Njegoš.